Meet the animal with the largest known number of genes …. the water flea, Daphnia pulex. With over 31,000 genes, Daphnia has over 8,000 more genes than Homo sapiens. But what is even more interesting is the fact that, according to the researchers at the Daphnia Genomic Consortium , almost 10,000 of these genes have not been previously described in any other animal. So why are scientists working on sequencing the genome of a water flea and what are the physiological roles of those 10,000 mystery genes? To get a better understanding, it is important to recognize the role of Daphnia in the natural world. It also appears that Daphnia’s genome is very rapidly evolving, duplicating genes at a rate that is 30 times higher than than of humans and 3x higher than other known invertebrates. Why? 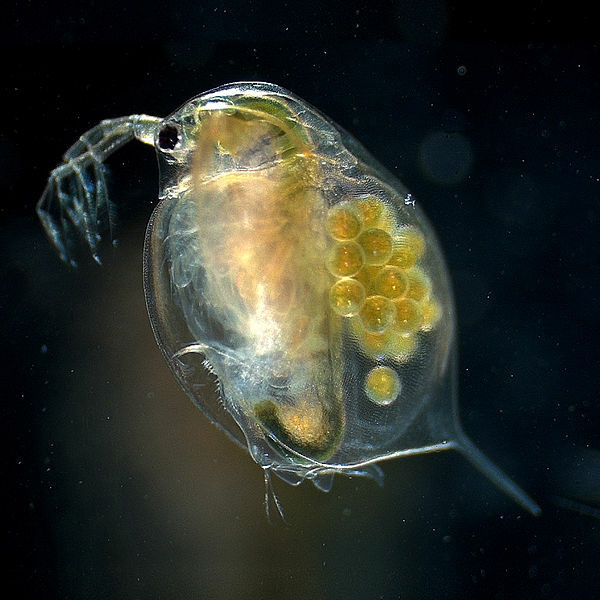 The researchers of this study think that this is an indicator that Daphnia is responding to environmental stress, most likely caused by chemicals in their environment. We already know that Daphnia respond to a wide-variety of chemicals in the environment, including nitrogen , but until this study, those responses were believed to be mostly the result of changes in gene expression. Daphnia has long been a model organism for the study of aquatic toxicology. These new findings suggest that it may also play an important role in developing an understanding of how the genome and environment interact – a relatively new area of science called environmental genomics.